Pixel Slate arrived at the Wilcox household on Nov. 28, 2018, from Google Store, with the order correctly fulfilled. Initial out-of-the-box reaction: “Oh”. Underwhelmed. Five days later: “Wow”. The Chrome OS tablet is understated in all the ways that matter. My brain just needed a wee bit of time to appreciate the many nuances, rather than one obvious thing flipping the “ah-ha” switch. The Slate will largely complete my transition away from Apple products, started in late July. The Chrome OS slab is set to replace iPad 10.5 and possibly could displace my beloved Pixelbook, as well. We shall see about the latter. The delayed “Wow” response means something. That said, Google’s tablet, like first-generation Chromebook Pixel, feels too much proof of concept: The hardware’s potential awaits future software, and supporting services, refinements. As such, based solely on a few days use, I don’t see the device as being right for everyone, or even most anyone. However, Google geeks will find something truly exotic to get excited about. Android and Chrome OS enthusiasts, rejoice! Linux lovers, too! 1. The 3000 x 2000 resolution display is breathtaking—absolutely fabulous. Text is super crisp, while colors are rich and vivid. I don’t know the screen’s nits but greater brightness would be my preference. That said, most people should be satisfied. 2. The front-facing speakers produce lush, punchy audio. They flank the screen and compliment it when watching content from services like Netflix. Sure, a good pair of external, Bluetooth speakers will produce broader soundstage and thumping bass, but the built-ins are surprisingly crisp without being too hallow. 3. The tablet’s texture in the hands reminds of Pixel 3 XL, despite differences in enclosure materials. The tactile, and also visual, likeness is about rounded corners and curved, sides/rim. For me, and maybe you, the familiarity feels as good to the emotions as the fingers. I cannot describe the emotional trigger other than to say it’s positive. 4. Industrial design reminds of the Nexus 10 tablet, which Samsung manufactured for Google (and the two companies co-designed). N10 was curvier, the bezels were broader, and the entire kit was smaller. But there is something about the material aesthetic and, more impactfully, feel against the fingers that vividly reminds me of the (very good) experience handling and interacting with Nexus 10. 5. Pixel Slate is fantastically physically balanced. I worried that, with 12.3-inch screen and 1.6-pound weight, the tablet would be unwieldy. Nope. I easily brandish the thang around with one hand, while not worrying about dropping it. Granted, functionality is a two-handed operation, but that’s to be expected from any larger tablet. 6. The (extra cost) add-on keyboard is Chromebook-class, if not better. One of Chromebook’s major benefits, regardless of computer cost, is the amazing keyboard. Google’s official $199 Pixel Slate keyboard case is unbecoming at first glance. The keys, while backlight, are odd for their round shape and orientation. So I was pleasantly surprised by how satisfying is typing. The keys have a softer feel than, say Pixelbook, while pressing comfortably and quietly. All future Chromebook keyboards should be like Pixel Slate’s, which wallops Apple’s offering for iPad and the clanky Butterfly kit built into newer Mac laptops. 8. The tablet user interface is very Android-like. When docked to keyboard, Pixel Slate’s UI is like any other modern Chromebook. But separated, a home screen of icons presents. Transition between the two motifs is quick and trouble-free, while the tablet orientation looks and behaves more like an Android phone. 9. Desktop browser on a tablet is a potent alternative to, say, Mobile Safari on iOS. Chrome is fast and furious, by comparison. Nuances are subtle compared to Chrome on Android, but the broader benefits are profound. Pages display as a desktop user would expect, and as quickly. 10. Pixelbook is the better value—at least during the Holidays. Much as I like Slate, the cost-benefit is difficult to justify and quantify when Pixelbook discounts are so appealing right now. Sales change, but as I write the Core i5 model with 8GB RAM and 128GB storage is available from Amazon for $849. The similarly-configured Slate costs $349 more when including Google’s keyboard. Entry-level Pixelbook has been available for as low as $699, since Black Friday. The starter Slate sells for $100 less but $99 more when including the keyboard. 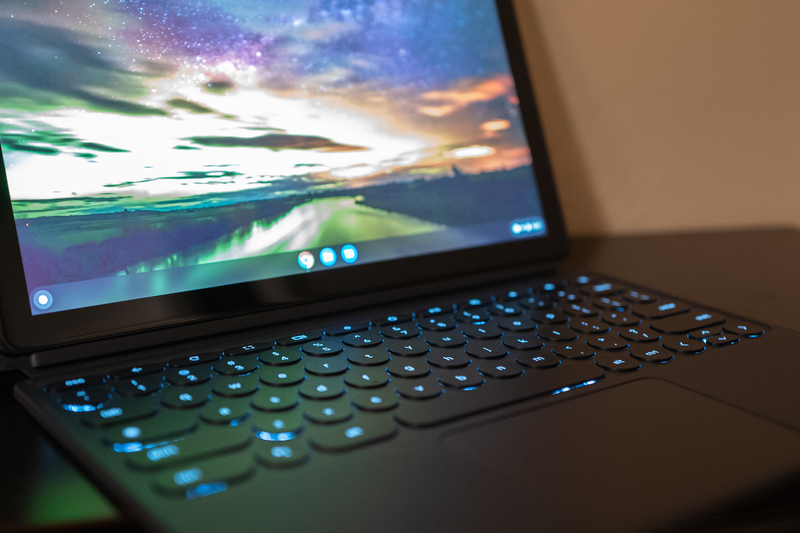 Much as Pixel Slate appeals to me, I am not the typical computer user. Most of the slab’s benefits are available on Pixelbook, which is the best Chromebook for your money. Period. However, as prices return to normal levels and I spend more time using both devices side by side, my opinion and recommendation may change. For now this: If you have to choose one or the other for productivity purposes, and tablet function is not your primary need, buy Pixelbook for the temporarily better cost-benefit. I used Leica Q to shoot the Featured Image, quite deliberately limiting depth of field to a portion of the keyboard. Vitals: f/2, ISO 1250, 1/60 sec, 28mm; Nov. 29, 2018; 6:04 p.m. PST.